I have bought a few items over the past month that have just been random pick ups and not really been 'hauled' so I thought I would just include them in to one post :) I thought there was more but maybe I have just forgotten few bits? Any wayyy I shall share my thoughts with you all. Such a bargain blusher, its a lovely peachy colour great for everyday. I love peachy tones at the moment and I think they compliment my skin well. This one doesn't last alll day but its good for popping out for a few hours etc. Im not sure how I feel about highlighters ! I don't like looking to shiny and sparkly thats why I picked up a cheap one to experiment with. I haven't used it much yet I think I would use it more on a night out or something? especially towards christmas time. Always a firm favourite of mine! I always re buy it however, I have been using less powder and I'm liking the 'dewy look'. Its affordable and looks lovely on my skin and I always enjoy having it as part of my makeup collection. I picked this up in the airport before I went on holiday, I do like it but I think a bit too much product comes out on the brush and can maybe be a bit hard to apply? 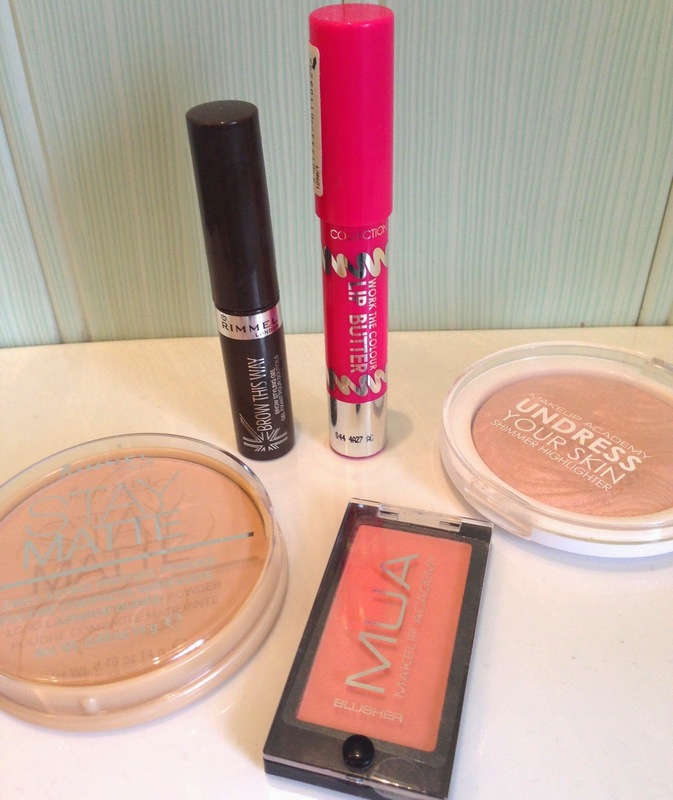 Its a nice cheap alternative to the benefit product however I prefer the Maybelline Brow drama at the moment.